Purpose. Danbury Orthopedics provides this website to allow our patients and other users to view health-related information, communicate with our practitioners and our staff, and arrange for clinical services and access additional related services. The information provided on this website is not a substitute for the advice of your personal physician or other qualified health care professional. Always seek the advice of your physician or other qualified health care professional with any questions you may have regarding medical symptoms or a medical condition. Never disregard professional medical advice or delay in seeking it because of something you have read on this website. Agreement. BY USING THE WEBSITE, YOU SIGNIFY YOUR AGREEMENT TO THESE TERMS AND CONDITIONS. IF YOU DO NOT AGREE TO THESE TERMS AND CONDITIONS, DO NOT USE THE WEBSITE. Integrity and accuracy of information. Although we attempt to maintain the integrity and accuracy of the information on the website, we make no guarantees as to its correctness, completeness, or accuracy. The website may contain typographical errors, inaccuracies, or other errors or omissions. Also, unauthorized additions, deletions, or alterations could be made to the website by third parties without our knowledge. If you believe that information found on the website is inaccurate or unauthorized, please inform us. Privacy Practices and Information. Any personal information that you may submit through the website is governed by Danbury Orthopedics’ privacy practices and information. Please see the “Privacy Information” page on this website. Danbury Orthopedics expressly reserves the right, in its sole discretion, to terminate a user's access to the website or any interactive services due to any act that would constitute a violation of these Terms of Usage. Disclaimer. THIS WEBSITE AND ITS CONTENT AND ALL SITE-RELATED SERVICES ARE PROVIDED "AS IS," WITH ALL FAULTS, WITH NO REPRESENTATIONS OR WARRANTIES OF ANY KIND, EITHER EXPRESSED OR IMPLIED, INCLUDING, BUT NOT LIMITED TO, THE IMPLIED WARRANTIES OF MERCHANTABILITY, FITNESS FOR A PARTICULAR PURPOSE OR NON-INFRINGEMENT. YOU ASSUME TOTAL RESPONSIBILITY AND RISK FOR YOUR USE OF THIS SITE, ALL SITE-RELATED SERVICES, AND THIRD PARTY WEBSITES. 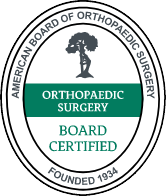 NO ORAL OR WRITTEN INFORMATION OR ADVICE GIVEN BY DANBURY ORTHOPEDICS OR ITS AUTHORIZED REPRESENTATIVES SHALL CREATE A WARRANTY OF ANY KIND. ANY REFERENCES TO SPECIFIC PRODUCTS OR SERVICES ON THIS WEBSITE DO NOT CONSTITUTE OR IMPLY A RECOMMENDATION OR ENDORSEMENT BY DANBURY ORTHOPEDICS UNLESS SPECIFICALLY STATED OTHERWISE. Limitation of liability. DANBURY ORTHOPEDICS AND ITS AFFILIATES, SUPPLIERS, AND OTHER THIRD PARTIES MENTIONED OR LINKED TO ON THIS WEBSITE ARE NEITHER RESPONSIBLE NOR LIABLE FOR ANY DIRECT, INDIRECT, INCIDENTAL, CONSEQUENTIAL, SPECIAL, EXEMPLARY, PUNITIVE, OR OTHER DAMAGES (INCLUDING, WITHOUT LIMITATION, THOSE RESULTING FROM LOST PROFITS, LOST DATA, OR BUSINESS INTERRUPTION) ARISING OUT OF OR RELATING IN ANY WAY TO THE WEBSITE, SITE-RELATED SERVICES AND PRODUCTS, CONTENT OR INFORMATION CONTAINED WITHIN THE WEBSITE, AND/OR ANY THIRD PARTY WEBSITE, WHETHER BASED ON WARRANTY, CONTRACT, TORT, OR ANY OTHER LEGAL THEORY AND WHETHER OR NOT ADVISED OF THE POSSIBILITY OF SUCH DAMAGES. YOUR SOLE REMEDY FOR DISSATISFACTION WITH THE WEBSITE, SITE-RELATED SERVICES, AND/OR THIRD PARTY WEBSITES IS TO STOP USING THE WEBSITE AND/OR THOSE SERVICES. APPLICABLE LAW MAY NOT ALLOW THE EXCLUSION OR LIMITATION OF INCIDENTAL OR CONSEQUENTIAL DAMAGES, SO THE ABOVE LIMITATION OR EXCLUSION MAY NOT APPLY TO YOU. THESE TERMS AND CONDITIONS ARE GOVERNED BY CONNECTICUT LAW WITHOUT REGARD TO ITS PRINCIPLES OF CONFLICTS OF LAW. IF ANY VERSION OF THE UNIFORM COMPUTER INFORMATION TRANSACTIONS ACT (UCITA) IS ENACTED AS PART OF THE LAW OF CONNECTICUT, THAT STATUTE SHALL NOT GOVERN ANY ASPECT OF THESE TERMS AND CONDITIONS. Other rights. Any rights not expressly granted by these Terms of Usage are reserved by Danbury Orthopedics. Content and features found on this website are subject to change or termination without notice in the discretion of Danbury Orthopedics.